Astrophysics is a peer-reviewed scientific journal of astrophysics published by Springer. It was first published in 1965. Each volume is published every three months. The editor-in-chief is David M. Sedrakyan. The focus of this journal is astronomy and is a translation of the peer-reviewed Russian language journal Astrofizika. 1 2 "Astrophysics - Springer" (Available online). Springer Science+Business Media. Retrieved 2014-08-16. Astrophysics presents recent theoretical and experimental advances in this field. The journal contains data obtained at the Sternberg Astronomical Institute and all principal Soviet observatories on planetary atmospheres, interstellar matter, solar physics, and space astrophysics. Additional subjects include chemical composition and internal structure of stars, quasars, and pulsars; stellar and galactic evolution; and developments in modern cosmology. 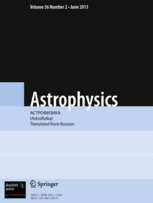 Astrophysics is a translation of the peer-reviewed Russian language journal Astrofizika.